New Albanian | Beer Apprentice - Craft Beer News, Reviews, Interviews and Info. Hello guys. For today’s craft beer review I’m going to be sampling the New Albanian Solidarity produced by the New Albanian Brewing Company located in New Albany, Indiana. Let’s skip all of the small talk and just jump to the website, newalbanian.com, to see what we can find out about this beer. 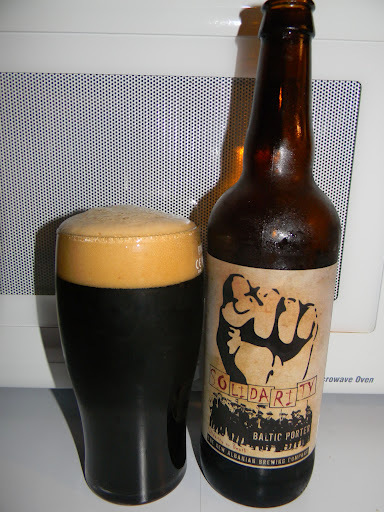 Baltic Porter is the best way to tip your hat to the activists in the Solidarity independent trade union, and a robust reminder of Baltic foresight in activism and strong beer. This Porter has an ABV of 8.5% and it comes in a 22 oz. bottle with one of the coolest labels I’ve ever seen. It poured a very dark brown to black color with plenty of ruby highlights showing through around the edges. It had a very nicely sized tan/khaki colored head that was very smooth, creamy and soft. The retention time was adequate and the lacing looked pretty good too. The nose presented some milk chocolate aspects. Also, I found some clean bread and grain hints. They were slightly toasted and earthy. The grainy tones really started to come to the forefront a bit more as it warmed. It almost had a “cardboard” type of smell too. Hmm. I didn’t really find any type of coffee or espresso aromas either, which usually accompany these Baltic Porters. Overall, I found the nose to be a bit subdued and restrained. The taste began with a nice dose of sweet chocolate malt and creamy milk flavors. Some roasted and toasted grains and breads. A smidgen of that Lager yeast became apparent as well. A touch of coffee bean was found, but it wasn’t very strong or robust. I could barely detect it actually. Oh well. It still tasted pretty nice I thought. The mouthfeel was medium to medium/thin. A bit thinner than I like to be honest. It was very smooth, slick and slightly creamy. It wasn’t as dry as I had hoped either. The carbonation was good though, however only an average amount of flavor was left behind on the palate after each gulp. Well, this beer was ok I guess. It just fell a tad short I thought. Nothing bad or off putting, yet mostly average all the way around. It definitely did not drink like an 8.5% ABV beer that’s for sure. I was taking huge gulps without even batting an eye. I received absolutely no alcohol in either the aroma or the flavor. I’d say that the New Albanian Solidarity could be a great introductory Porter for someone interested in exploring the style. I would never turn it down and I would suggest that you give it a try if you see it, however don’t expect to be blown away or anything. With that being said, let me know what you think of it if you try it or have tried it. Thanks for checking in on another review guys. I really appreciate it. I have many more to come. 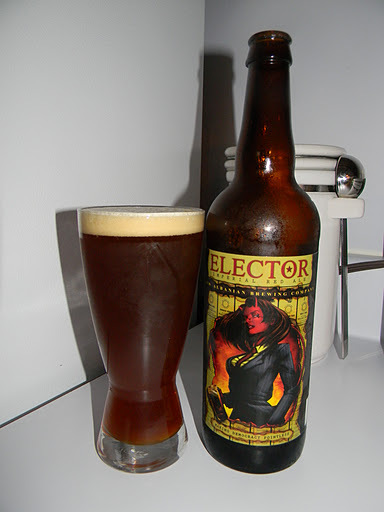 For today’s craft beer review I’m going to be sampling the Elector Imperial Red Ale produced by the New Albanian Brewing Company located in New Albany, Indiana. I’ve only had one other beer from this brewery, the Hoptimus, so I’m still a little undecided on how I feel about the overall body of work that they produce. From the website, newalbanian.com, we find this description. Richly malty and excessively hopped, Elector was first brewed on Election Day, taking its name from the Electoral College. In like fashion, Elector’s unique character makes democracy pointless. It severs party affiliations, crosses the aisle, and commands you to drink early and vote often. That’s because whenever Elector is on the ballot, there’s only one real choice. The brew comes in a 22 oz. bottle and it has an ABV of 7.5%. The beer poured a very hazy, copper to amber color with an “ok” sized, khaki colored head that was very creamy, smooth, soft and thick. The retention time was very good and it left behind some very, very, very nice lacing. The brew even poured thick and heavy. The aroma suggested heavy doses of caramel and toffee malt. It was very sweet smelling I must say. Some earthy and herbal hops counterbalanced the sweetness somewhat. Densely toasted breads and bread crusts intertwined with slight buttery hints and some fruitiness from the likes of apples and pears. The taste was eerily similar to the fragrance. Sturdy and robust caramel and toffee malts fused with toasted biscuits and baked breads. A solid earthy and herbal punch with a sufficient amount of bitterness. Fruity apples and buttery jolts all add up to one very sweet flavor. I didn’t detect any alcohol, which was a bit surprising considering the 7.5% ABV. The mouthfeel was medium to full bodied. It was dry, smooth, thick, chewy, creamy, oily and thick. A very faint alcohol warmth was noticed and the palate was drenched quite well with flavor after each gulp. A great feel with this beer. I’ll tell ya. We have a very good beer here, but man is it sweet!!! The caramel and toffee never subsided throughout the entire experience. That could very well deter some from liking this. It made for a fairly tough drink in that regard. It was quite filling and heavy. I would definitely recommend giving it a try though. The hops do help as far as providing a slight antidote to the sweetness. I don’t think that this would be a beer that I could have on a daily basis, but every now and then wouldn’t be bad. I wouldn’t mind having another bottle, but preferably during another setting. With that being said, give the New Albanian Elector a try and let me know your interpretation. Not too mention what you think of that very cool looking label. For today’s craft beer review I’m going to be trying the Hoptimus brewed by the New Albanian Brewing Company located in New Albany, Indiana. I have yet to try a beer from this brewery and I’m really looking forward to it since New Albany is not too far from where I live, so even though it’s in another state, I still consider it local. Let’s see what the website, newalbanian.com, has to say about this brew. “Vicariously” is for rank amateurs and subpar international lagers, because Hoptimus lives vivaciously through itself, and is best consumed in the prime of youth, when its bold hop character is at its snarkiest and most blatantly unrepentant. This brew has an ABV of 10.7% and it comes in a 22 oz. bomber. The Hoptimus poured a clear, amber to copper color with burnt orange highlights showing through at the bottom. The head was off white/light tan in color, very smooth, creamy, full, soft and of good size. The crown really stuck around for a good long while. The lacing looked awesome. It was very thick and chunky on the sides of the glass. The head finally settled to a thick, creamy film on top of the liquid. Man, it looked good. The nose consisted of some very earthy smelling hops and rich caramel malts. Hints of toasted wheat bread and butter continued to help distinguish this beer as “herbal”. I did notice that it smelled a slight bit musty, however after it warmed a bit, fruity tones of apricot, over-ripened apples and very, very minor peach notes helped create a more pleasant bouquet. The taste brought forth more of the caramel sweetness. Savors of toffee were noticed also. Like the smell, the taste was very earthy and herbal. Toasted bread crusts along with a candied, caramel apple distinction made for a pleasing drink. I didn’t think the hops were overbearing, however there was no denying the forceful bitterness that accompanied the flavor (100 IBU’s!!!). I was expecting more of the citric hops, but didn’t find any. Oddly enough, at 10.7% ABV, I found no traces of alcohol. The mouthfeel was medium bodied, very smooth and creamy. It had some bite, but very little alcohol warmth. It seemed very dry and chewy also. Plenty of flavor was left behind on the palate for me to enjoy between sips. Very nice. I think we have a pretty good beer here. It’s not quite the citric hop bomb that one would typically expect to find in a DIPA/Imperial IPA, but rather it is much more malt foreword. Also, I wouldn’t say that it’s as good as some others of this style that I’ve tried , but it was still a very enjoyable and easy drink that’s worth a try in my opinion. I would have no problem sitting down with the Hoptimus again that’s for sure. I’m looking forward to trying more brews from New Albanian in the future and I would love to hear what you guys think of them if you have had the opportunity to sample their products. Thanks for reading and commenting everyone. Be sure to look me up on Twitter (@BeerApprentice or @shrews824) and Google+ (Scott Shrewsberry) if you would like to discuss craft beer a little more.